IKEA SPOTTER: What do you mean you haven't seen it??? What do you mean you haven't seen it??? The first show on the list is Veronica Mars (2004). How my friends haven't disowned me for putting this off for so long is a big mystery; one that only our intrepid PI might be able to solve. Because I'm featuring three seasons at once with a high concentration of spottings there are going to be several posts for this show. I'm going to start off with sets regularly featured through out the most of the 3 seasons. The first major set with IKEA elements is the Mars' kitchen. Staying consistent over the 3 seasons, the Mars' kitchen features the GRUNDTAL wall system. The spice rack has DROPPAR spice jars, there is the magnetic knife rail, a smaller GRUNDTAL shelf from which DIREKT utensils are hung. Onto Veronica's bedroom. 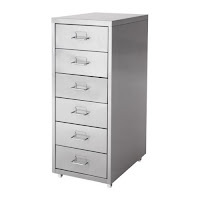 In the pilot and after episode 6 of season 1 it features gray HELMER drawer units by her desk. The paper organizer over her shoulder looks like the FLÄTA but it is not. Also in the desk area is a BENNO media tower. I'm going to call the bookcase a BILLY but I don't remember seeing the top of it to tell for certain. 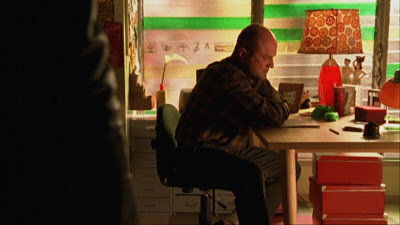 In season two, episode 11 there are KASSETT boxes tucked underneath the desk. 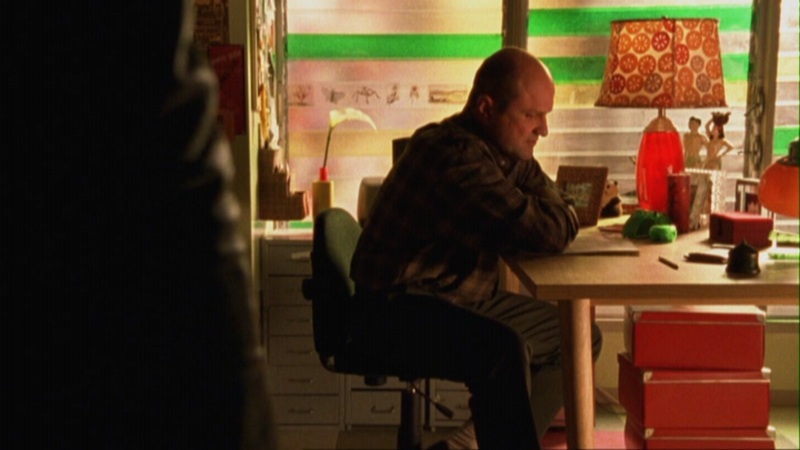 This screencap is from season 1, episode 4 and you can see that her bed is where her desk was in s1ep1 and then post s1e6. 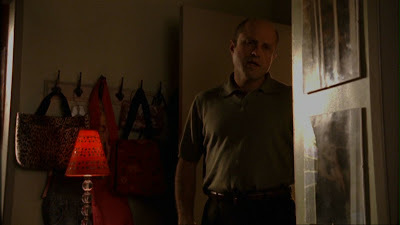 See the HELMERs near the window & the paper organizer on the wall? Really not an ideal place to put drawer units but there you are. 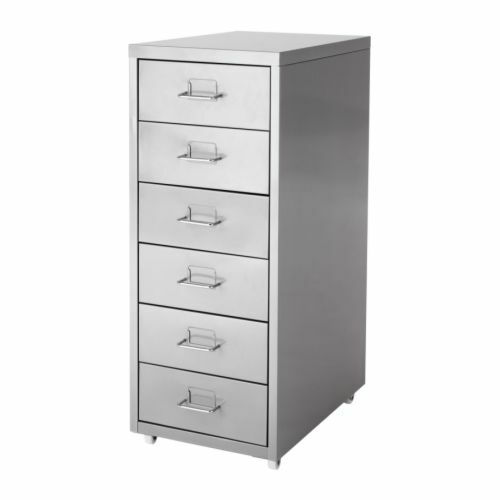 Behind her bedroom door is LEKSVIK rack with 5 hooks. Another set frequently visited in seasons 1 & 2 is the journalism room. 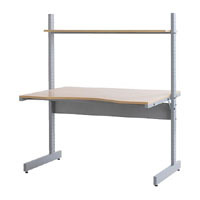 There are popular but sadly discontinued JERKER desks lining the room. A dark shot of the room but it gives you the sense of the quantity of desks on both sides of the room. 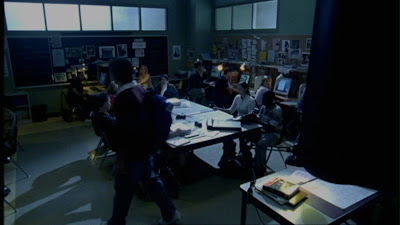 Here is another room, which I believe is the a computer lab, that also features the JERKER desks. 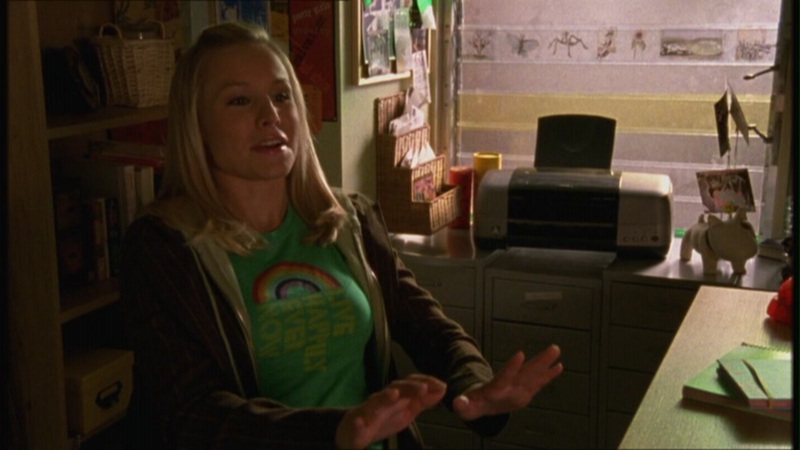 When Veronica Mars graduated from high school I hope they sold these to some very grateful computer people. It is sad to think these may have been junked. The last big regular set piece is first seen in the first episode of season 2. Since this post is getting long, I'll feature that in its own post. What do you think it is? Come back tomorrow to find out. SO excited you're finally watching it! Subliminal message - eat mac & cheese? It's as clear as black & white.